MAN Sports brings you Blockbuster, the new explosive way to start your training! The dose of Choline Bitartrate in its formula promotes heightened mood, as well as amplified focus to help you get the most out of your workout. The Hydromax Glycerol Powder promotes an increase in endurance and stamina, letting you train harder and longer. Blockbuster also uses no proprietary blends, meaning you know exactly what you’re getting in each serving. Get that shredded body you’ve been dreaming of, with Blockbuster! As a dietary supplement, take 1 serving (1 scoop) with 8oz of cold water 30-45 minutes prior to training. To avoid sleeplessness, do not take within 6 hours of sleep. Contents may settle after shipping. Shake container prior to each use. Store in a cool, dry place. 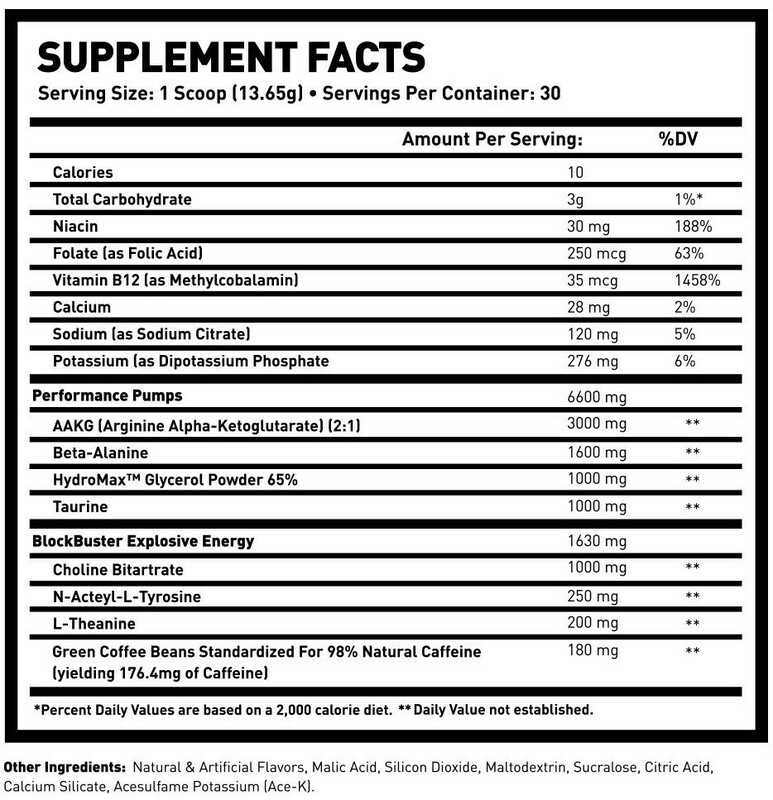 DO NOT EXCEED 2 SERVINGS IN ANY 24 HOUR PERIOD OR USE MORE THAN 5 DAYS IN ANY 7 DAY PERIOD. For use as a dietary supplement only by healthy adults the age of 18 and over. Do not use this product if you are nursing, pregnant, or attempting to become pregnant. Contains caffeine. Do not combine with other sources of caffeine or stimulants. Do not use for more than 12 weeks. Consult a physician before using this or any other dietary supplement. Do not take this product if you have any pre-existing medical conditions or if you are using any prescription or over the counter medication. Discontinue use and consult your health care professional if you experience any adverse health effects from this product. This product may contain ingredients banned by certain sports organizations. User accepts all risks, liabilities, andconsequences in regard to testing. Do not use if safety seal is broken or missing. Use only as directed. Do not exceed recommended serving underany circumstances. KEEP OUT OF REACH OF CHILDREN. Allergen Warning: This Product is manufactured with equipment that process products that may contain milk, egg, soy, tree nuts, peaunts, wheat, fish, crustaceans & shellfish.